I adore the polka dots and lace...so pretty. I just bought a top similar to the one your wearing and I love how you put a belt on top. You look great! Love the outfit and can't wait to read all about Europe! Love the skirt! So adorable! And I think you did the right thing not telling the world you were gone from your house. Can't wait to hear about Europe! this outfit is PERFECT! can't wait to hear about your adventures! What a pretty outfit and I can't wait to hear about Europe. I've been there a number of times and would love to go again. Two weeks in Europe? Heck yes, it was totally worth it. :) You look adorable in this outfit. 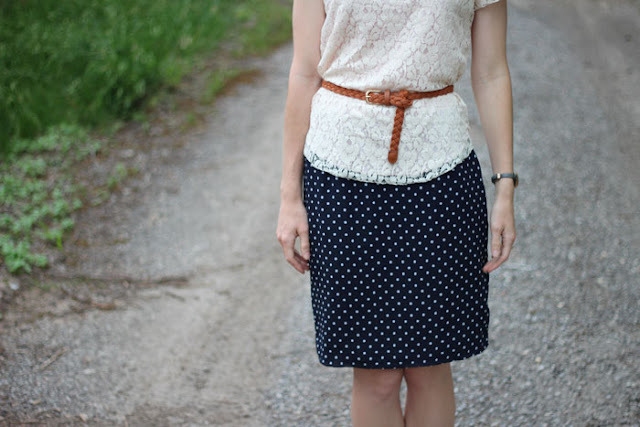 The lace top looks so pretty with your navy polka dot skirt! And the belt adds the perfect touch :) Love this! Yeay you are back, Ash. I did miss you. Cannot wait to hear back from you regarding your vacation. Great come-back Outfit. I have a skirt almost identical to yours. I even have a belt almost the same as yours. I now need an Off-White Lace Top to wear it just like you. I love your Flats too and I agree a great Flat Sandal or Ballet Flat is necessary (more than 1 single pair) in one's closet. 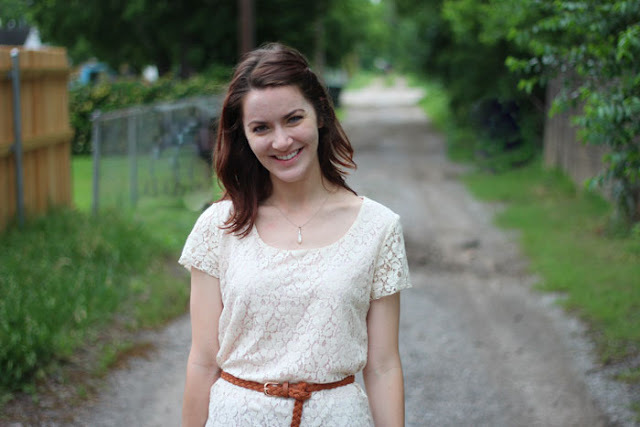 I adore your lace top! (i love TJ Maxx!). Your skirt is so cute! Ooh, Europe - I hope you had fun! Also, I love this combination of lace and polka dots. Two of my favorite things! 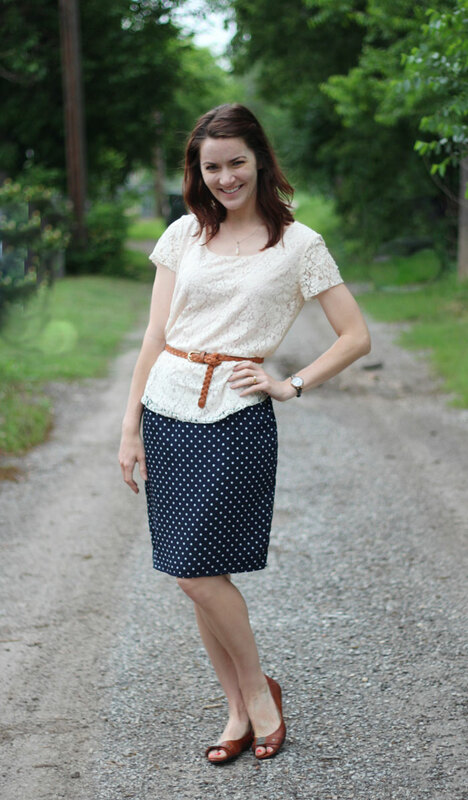 Love the lace and polka dots! Glad you had a great trip! And you're back with a bang, too! I love the lace and polka dots. I can't wait to hear about your trip! oh! the outfit becomes you perfectly! I specially love the blouse! Thanks for stopping by my blog. This is such a lovely outfit! Polka dots and lace are such a great combo. 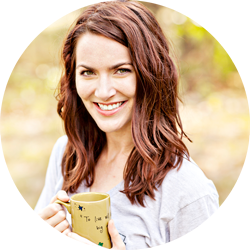 I'm following you on bloglovin now, I'm excited to see your future outfit posts! Wow, Europe, I am so jealous! I think you are so right not to share sometimes. We missed you. I hope you had a blast! Love the dots! I totally just bought this exact top (but with a yellow underlay) from TJ Maxx last week! I love everything about this. 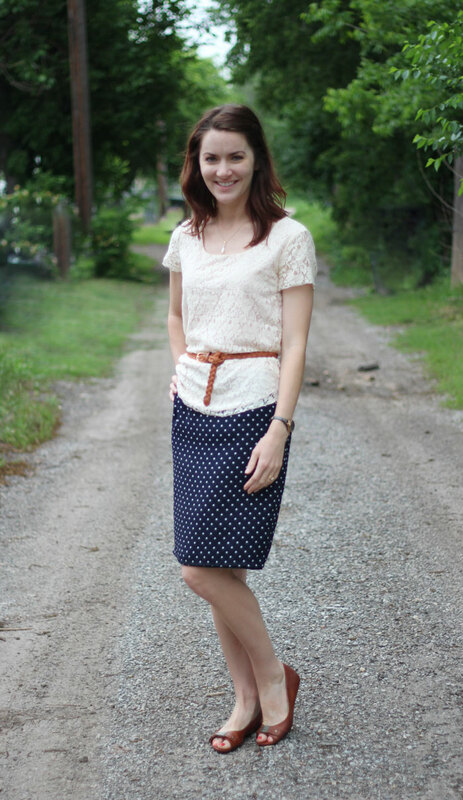 Lace and polka dots are my biggest weaknesses, so I'm just swooning over this look. I love this outfit and girl you have hit the big time! 22 comments! I am genuinely proud of you! Can't wait to chat in person! I can't wait to see how your trip went! And lots of pictures!! 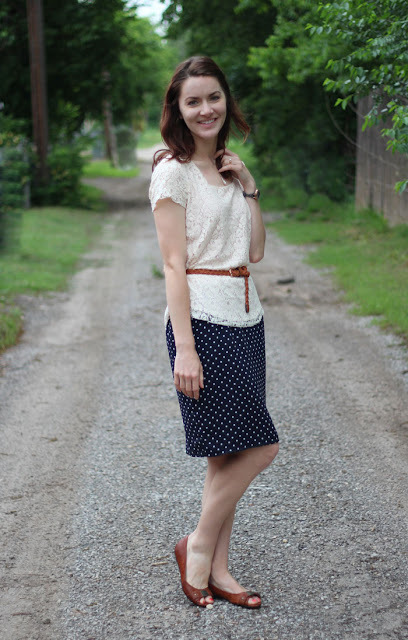 I really like your outfit, I just wore my polka dot skirt today, it's so fun! Now that you're back, does American life just seem to pale in comparison?